I made some twin fin paipos (42 1/2" x 19 3/4" ) for an art show in New York. They are finished with all natural oils and beeswax. They are built with marine plywood. They are for sale through this site for $250. I'm also selling them as a kit for $100 which includes marine plywood for board 3/4" and keels 3/8" with traced templates, all natural concentrated sealing oil blend, beeswax, "You and Your Surfboard" reprint, and directions and tips from me. Surfing began on tropical islands with simple planks of wood. Even today you can still find pockets of indigenous surfing culture in islands off Africa. People like Tom Wegner are helping to encourage the revival of traditional Hawaiin designs. In Hawaii small planks for surfing on your belly are called paipos. Traditional surfcraft are finless and require a different approach to wave riding and edge holding. My design borrows the twin fins made popular in the 60s by the fish surfboard designed originally by Steve Lis. The fish surfboard was very popular with backyard shapers. It was sort of the people's surfboard design. 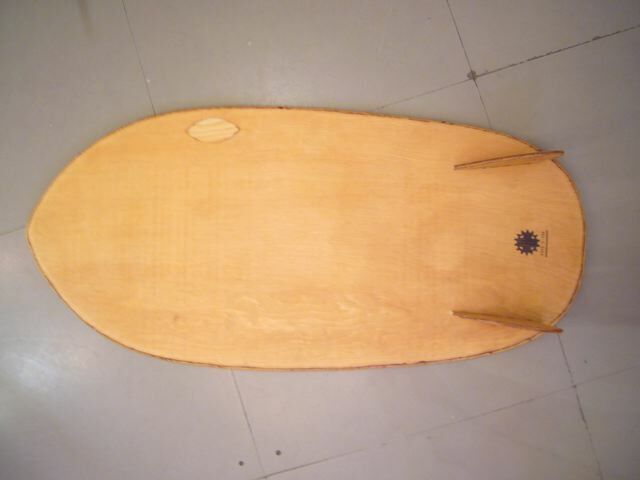 You don't often see twin fin paipos but I came across images of a few made in Australia; apparently mostly by kids in wood working classes. 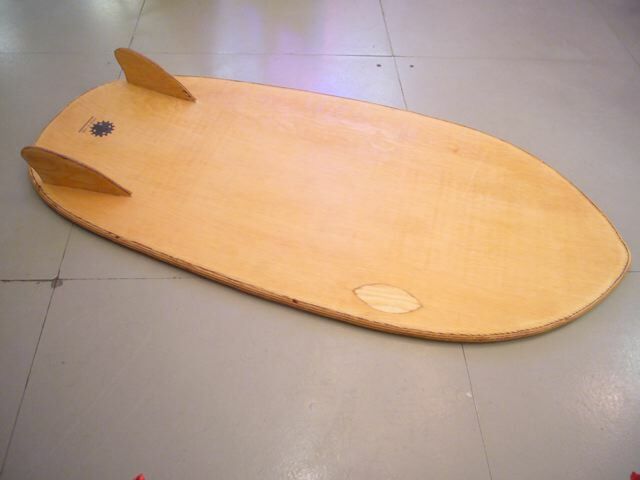 I liked the pairing of the home brew twin fin with the shop class plywood paipo. The first time I had it in the water I thought it might sink. I took off on a few waves and had some nice little rides. I was surprised how easy it was to catch a wave on something with so little float. I had always associated float with wave catching ease. But it doesn't apply to paipos; especially not when you are wearing a nice powerful set of swim fins. Eventually I paddled over to the main take off zone, right off the jetty, at Rockaway beach. The rides were amazing. I was picking off the biggest set waves and tearing down the face holding amazing high lines. The twin fins make the board loose and very responsive. At one point I threw my arms back against my sides and just wizzed along with my face over the front the board inches above of the water. A big plus of paipos is the ability to dive under oncoming waves and continue moving along under the water. There's nothing easier to paddle out with than a paipo. The board is sealed with natural oils and then coated with melted beeswax.